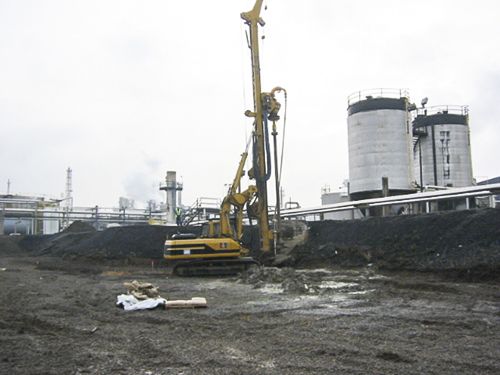 Geo-Solutions was contracted by a major refinery to perform a multi-phase remediation project at an active refining facility in Lima, Ohio. The site consisted of a former sludge/storm water control pit. Soils in and beneath the pit were impacted with a wide range of petroleum hydrocarbons and free product from the petroleum refining facility. Geo-Solutions initially performed a treatability study to select potential reagents, determine compatibility with site-specific contaminants, and optimize proposed mix designs for use in the proposed soil-mix wall. Geo-Solutions obtained site samples and performed the bench-scale treatability study. Phase I involved installation of a soil-bentonite low permeability vertical barrier wall around the perimeter of the stormwater control pit to isolate it from the remainder of the site. 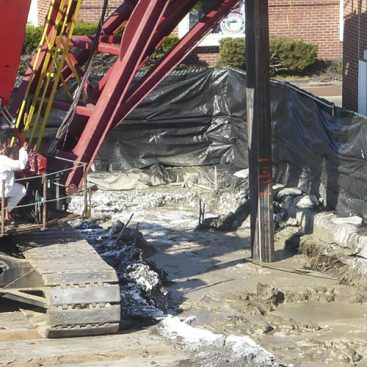 Due to access limitations and ground conditions, Geo-Solutions elected to install the barrier wall by the in-situ shallow soil mixing (SSM) technique. The barrier wall consisted of a series of overlapping 4-foot diameter soil mix columns to create the continuous vertical barrier. The columns were installed on 3.2-foot centers providing 0.8 feet (20%) of overlap on each column. The layout provides a minimum effective barrier thickness of 2.4 feet. With a barrier length of 875 lineal feet, 273 columns were installed to complete the work. 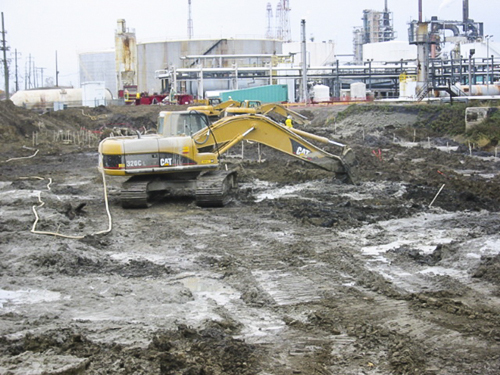 Bentonite slurry was incorporated into the soil to form a low permeability soil mix. In an effort to minimize spoils generation, Geo-Solutions pre-drilled or pre-excavated 3 to 4 feet of soil at the top of each column. Swell from the SSM operation was used to fill the excavation to complete the barrier to the finish grade. Cement was incorporated into the top 5 feet of the wall to create a stable surface and cap. The work included installation of a cement-bentonite plug where the barrier wall crosses an existing 30-inch diameter sewer line. This task presented several challenges due to the potentially unstable saturated coarse sand zone 10 to 15 feet below the surface. This layer would likely generate significant groundwater into an open excavation and be very unstable. Geo-Solutions proposed to install a soil-cement SSM wall around each pipe plug to provide temporary excavation support and seal off much of the sand layer and associated groundwater from entering the excavation. Once the SSM wall was completed and cured, the interior was excavated on both sides of the pipe with an excavator. 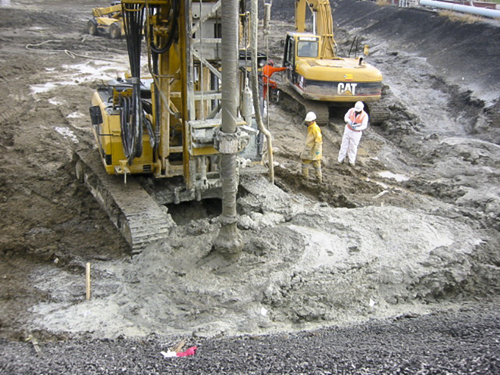 A trench box was used so that personnel could enter the excavation and clean out beneath the pipe prior to backfilling with the specified cement-bentonite grout. Phase I of the project also included a pilot program to evaluate treatment alternatives for stabilization of the impacted soils within the former sludge/storm water control pit. Reagents evaluated included cement, bentonite, permanganate and Fenton’s reagents. Phase II of the project essentially consisted of the solidification/stabilization of 20,000 cubic yards of petroleum impacted soil. Soil mixing was accomplished by the shallow soil mixing method. The site was divided into pre-measured, numbered cells to ensure 100% treatment. The cells were approximately ten feet by ten feet and were up to fifteen feet in depth. Soil mixing was accomplished with a combination of Geo-Solutions’ Backhoe Operated Soil Stabilization (BOSS) method and two excavator-mounted blending units, which mixed the in-place soil with cement grout produced in Geo-Solutios’ custom batch plant. In some areas clean overburden was removed prior to soil mixing in specific cells to address only the impacted soil within a discrete depth interval. Soil-Cement samples collected exceeded 100 psi unconfined compressive strength, and also passed project specific TCLP criteria after 28 days of cure. 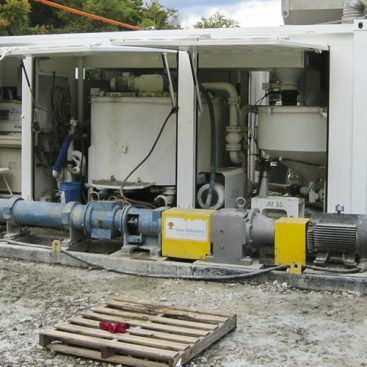 Following the completion of the Phase I and II Stabilization, Geo-Solutions was contracted for the final phase of this project – to complete the cap and closure of the now stabilized former sludge/storm water control pits, in preparation for its use as a refinery cleaning and decontamination pad. Removal of perimeter berm, which was placed as fill, compacted and rough graded. Fine grading of the subgrade in preparation for 3-layer Geosynthetic liner system placement. Placement of 51,660 square feet of Bentomat clay liner, 40-mil LLDPE FML, and Geonet drainage layer. The completion of all phases of this project demonstrated Geo-Solutions’ versatility and ability to provide complete turn-key environmental solutions. Because its own Health and Safety culture Geo-Solutions easily adapted to the client’s extremely stringent Health and Safety policies and procedures and the project was completed safely and successfully.